With ornate decorative effects being incorporated into more and more roof designs these days, Heritage Clay Tiles offers Club tiles in a range of three colours, Red Medium and dark that are compatible with Heritage range of tiles. Heritage Clay Tiles Ltd offer ornamental club clay tiles with a guaranteed performance in all weathers to 35° pitch. This guarantee is offered across all of our ornamental clay tile ranges. All our ornamental club clay tiles will meet the stringent requirements of BS 5534: 2003 Code of practice for slating and tiling, providing our clay tile fixing recommendations are followed. Clay roof tiles have a very long and rich heritage in the United Kingdom and their popularity has spread across the globe in more recent years. 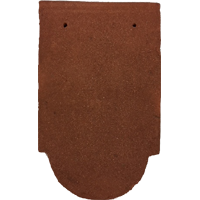 If you look at the roof area of a building you will probably see an amazing assortment of these clay roof tiles, you will also see angle ridges and an array of different fittings. The more ornate clay roof tiles, angle ridges and fittings are not just found on historic homes like mansions either, they can also be found on new build homes as small as a one bedroom maisonette. The main reason why clay roof tiles, angle ridges and fittings are so popular is because concrete alternatives tend to lose their colour over a relatively short time, whereas clay tiles maintain their hue and can even look better with age, by developing a wonderful patina over a protracted period of time. Heritage clay roof tiles, angle ridges and fittings are extremely durable, often lasting around 65 years or more. Heritage Clay Tiles Ltd, are the United Kingdoms leading supplier of high quality handmade and handcrafted clay roof tiles, peg tiles and machine made tiles. As stated above, we do manufacture and supply modern, machine made clay roof tiles, angle ridges and fittings, as these are frequently required for contemporary and traditional type builds. But all too often, authenticity is an absolute priority in the build specification, particularly if it's a restoration project, there simply is no substitute for handmade clay roof tiles, angle ridges and fittings. What is a traditional handmade clay roof tile? In the past, the clay that was to be used for clay roof tiles, angle ridges and fittings was dug in the locality where the builds were to take place. Once dug, the clay would be left to weather before being worked with. The blocks of clay would then be mixed with water and moulding sand before being thrown into wooden moulds. The clay was then wire cut to the correct size and finished by hand. The hand made clay tiles, angle ridges and fittings were then stacked outside to dry out in the sun before they were kiln fired to set the colour. Clearly there would always be regional differences in the type of clay and moulding sands that were available. The firing methods used would also differ from region to region and this led to very obvious differences across the country in terms of the finished products colour and texture. Even some marked differences could be identified as being like a trademark of a particular craftsman. This sort of individuality and uniqueness in the manufacture of the clay roof tiles, angle ridges and fittings are nearly impossible to replicate with a purely mechanised production system. 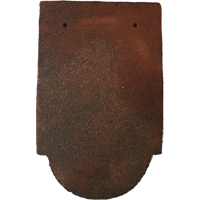 Heritage handmade clay roof tiles, angle ridges and fittings are available in very wide range of shapes and sizes and these include the special ornamental styles, such as club and Hog nose designs. Should you not be able to find the clay roof tiles, angle ridges and fittings that you require, please feel free to contact us and we will be happy to help. Handmade clay roof tiles, angle ridges and fittings came to be a standard size about 500 years ago and the same sizes are adhered to today. Todays machine made clay roof tiles, angle ridges and fittings are manufactured in equivalent metric sizes. Handmade clay roof tiles, angle ridges and fittings are still made in imperial sizes to maintain the original proportions from there original designs. Plain clay roof tiles are laid on the roof in a broken bond that is known as double lapping. They are laid in this fashion to achieve watertightness. To give the correct coverage, a square metre requires about 60 tiles of roof area. What are modern handmade tiles? Heritage clay tiles modern handmade clay roof tiles, angle ridges and fittings are produced using a more up to date process. This method of manufacture ensures that the relevant British Standard is adhered too. The British Standard dictates the tiles strength, resistance to frost and its the tile has sufficient impermeability to water. The modern production process has done away with throwing the raw clay into moulds and now relies on a machine to extrude the clay into a continuous column. Once the column of clay has been extruded, the correct size of tile can then be cut with wire and then moulded by hand. So although the clay roof tiles, angle ridges and fittings are produced by machine, the working and shaping is still carried out by hand, thus giving the clay roof tiles, angle ridges and fittings their individual looks. Heritage Clay Tiles tend to use locally quarried clay wherever we can. However, different regions, produce different clay and if we need a particular characteristic reflected in a batch of clay roof tiles, angle ridges and fittings, we will order clay from another region that has suitable clay. The addition of manganese and sawdust can sometimes be added to the raw clay to create a more weathered or aged colour and texture. 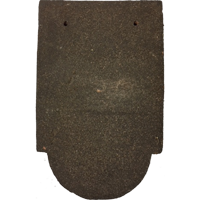 Adding more manganese to the raw clay will produce a far darker clay roof tile, angle ridge or fitting when the product is fired. Generally, the clay we use in our hand formed clay roof tiles, angle ridges and fittings, is a little coarser than the clay we use in our machine made tiles. Although the finish of both is like a sandfaced texture, the coarser clay gives a more hand made appearance and slightly rougher texture. The firing process we employ can be used to enhance the colour of the finished clay roof tiles, angle ridges and fittings. Handcrafted clay roof tiles, angle ridges and fittings: The tile between machine made and hand made! Handcrafted clay roof tiles, angle ridges and fittings have an automated manufacturing process up to just before the tile is fired. At this point the clay roof tiles, angle ridges and fittings are taken off the production line and finished by hand to replicate a more rustic texture and hand crafted finish. So why use clay roof tiles, angle ridges and fittings? Aesthetics: Clay roof tiles, angle ridges and fittings come in a wide variety of shades and textures. Clay roof tiles, angle ridges and fittings are unaffected by extremes of temperature and the seasonal climate changes experienced throughout the United Kingdom. Cost: The life span of the product ensures it is a cost effective roof covering as the clay roof tiles, angle ridges and fittings will tend to last the lifetime of the building. If you would like to know more or are interested in a quote we would be happy to help. Phone us on 01708 853 953, email us at sales@heritagetiles.co.uk and we will be in touch as soon as possible.